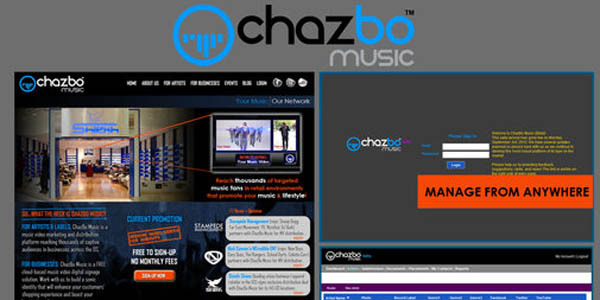 ChazBo Music, a Los Angeles-based music tech startup, announces the rollout of its beta platform to offer artists a music video distribution and promotions platform to reach thousands of viewers and businesses a FREE cloud-based music video digital signage solution. CM’s cloud-based MusiChannels are distributed over the Internet and displayed in any web browser that launches in full screen mode on TVs in stores. The company also offers premium media players to support stand-alone kiosks and displays. The service was developed to meet the needs of thousands of small and medium sized businesses who seek to offer music videos in their establishments but cannot offered the costly service fees or upfront hardware costs of ChazBo Music competitors. CM has signed a major subscription deal with Shiekh Shoes, the leading urban contemporary footwear and apparel retailer in the US, to supply its 150+ US locations with a branded MusiChannel called ShiekhTV. CM has begun to team up with several record labels and management companies such as Def Jam Recordings, Stampede Management (manages Snoop Dogg, Mystikal, DJ Quick, YG, Far East Movement, The Airplane Boys, Kendre, Mali Nicole, Corib, and Shrona) and Nick Cannon’s NCredible Entertainment (manages Cory Gunz, New Boys, The Rangers, Colette Carr, School Gyrls, Wonder Broz, Gabi Wilson, and Hero) to distribute music videos from more emerging and established artists in addition to its indie artist catalog.